We are not good people. Well, most of us anyway. And when I finally went and saw Dawn of the Planet of the Apes last night that only confirmed this. But I’ll get back to that in a minute. As you may or may not know, for me to actually get out to a theater to see a movie is nothing short of a minor miracle, so when I am going to plunk down my hard-earned dollar it’s gotta be for something special. Otherwise, I can just wait for the DVD. Hell, the window is only three months at this point. But I am such a fan of both the original franchise and the 2011 film that I HAD to see this one as soon as possible. And to be honest, I loved every minute of it. 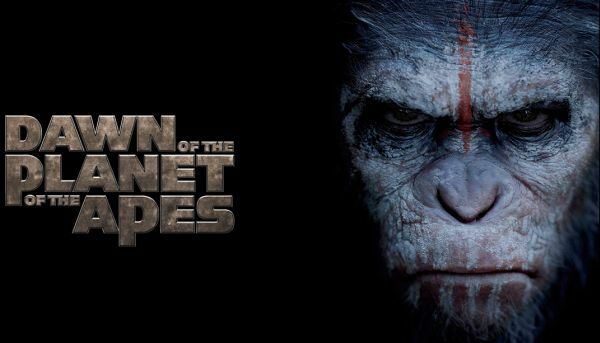 Set ten years after Rise of the Planet of the Apes we now find Caesar (Andy Serkis) and his band of apes living in Muir Woods, with returning characters such as Maurice (Karin Konoval) teaching school and Koba (Toby Kebbell) as Caesar’s right hand (at first). Everything seems fine until one fateful afternoon when Caesar’s son Blue Eyes and his friend Ash encounter a small band of humans on their way home from a fishing trip. In a panic, the human Carver (expertly played by Kirk Acevedo) through one senseless act sets off a chain of events leading to mutual distrust on both sides, and a short time later it is his distrust of the apes that is the catalyst for all-out war, due to ANOTHER stupid move. Of course, by this time Koba is chomping at the bit to attack the weakened human city, and through a rather Machiavellian course of action he is able to incite the apes to violence. In the aftermath, Caesar comes to realize he was wrong believing apes were better than humans having now seen what they’re capable of and realizing the two are not so different after all. The rest of the human cast (Gary Oldman, Keri Russell, Jason Clarke, Kodi Smit-McPhee) all play their parts very well, but Acevedo’s portrayal really affected me most. Because his blind hatred of the apes is a mirror image of how many view the world today. We are taught to hate and fear what we do not understand. And I applaud the filmmakers for not blaming any one side for the war that ensues.